According to its recent annual report released by the U.S. Commission on International Religious Freedom (USCIRF), Myanmar has remained one of the top 10 countries where the governments are found to be one of the world’s worst violators of religious freedom. Since the military rule began in 1962 successive Myanmar governments have long discriminated against Burmese Muslims in general, and Daw Aung San Suu Kyi’s NLD government now heads a “Muslim-free” parliament, having opted to allow no Muslim representation in the current democratic transition. 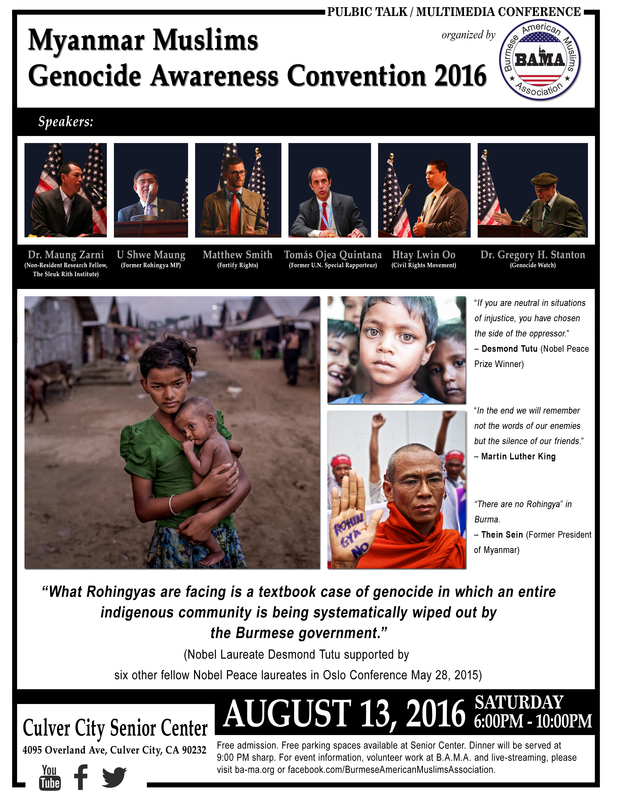 Equally important, the governments of Myanmar have since the late 1970’s subjected Rohingya Muslims to a systematic policy of discrimination, exclusion, persecution, and communal destruction, – in short – annihilation, under the false but widely popularized pretext of illegal immigration of Bengali from the neighboring Bangladesh. There has only been an outflow – not inflow – of Muslims from Myanmar fleeing persecution, mass organized violence and discrimination. The severity of the ongoing persecution of the Rohingya on grounds of their distinct self-identity has resulted in an widely acknowledged humanitarian catastrophe. 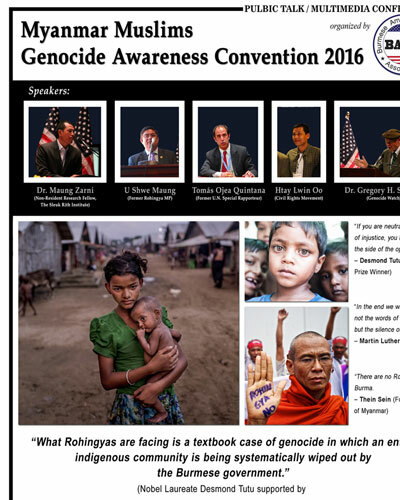 Myanmar Muslims Genocide Awareness Convention (MMGAC) has adopted the following set of resolutions in order to keep the spotlight on the still unfolding genocidal persecution against the Rohingya and the now-institutionalized discrimination against all Muslims of Myanmar. We demand that the Myanmar government offer full security to humanitarian NGOs and INGOs in order that they may conduct the vital mission in Rakhine state and all other effected areas where Muslims live in constant fear of organized violence, wanton destruction and ostracism. We demand that the government of Myanmar return the land and properties that belong to the displaced people and rebuild the places of worship and homes destroyed by the violent mobs. We demand that the government of Myanmar respect and honor the Rohingya people’s right to self-identify, an international human rights and conversely, stop the process of Bengalization, which only perpetuates the already popular stigma – that the Rohingyas are “illegal invaders” from Bangladesh. We demand that the government of Myanmar publicly acknowledge the official documentations in its archival possession, which unequivocally support the presence, history and identity of the Rohingya people as an integral community of the Union of Myanmar. We demand that the government of Myanmar review and revise the 1982 Citizenship Act – adopted by the military dictatorship of General Ne Win – where anti-Rohingya racism was encoded, thus making its officially and institutionally discriminatory towards the Rohingya. We pledge that we will work with all like-minded activists, experts and government officials, who wish to bring an end to both general racist discrimination against the Muslims and the on-going process of systematic annihilation of the Rohingya. Finally, we further pledge to cooperate fully with any legal experts and researchers who intend to bring to the International Criminal Court the individuals and the organizations found to be involved in the slow genocide of the Rohingya people.